Randall joined the Clark team in 2000 and has over 29 years experience in the Graphic Arts Industry. His background includes an array of film-stripping, proofing and plating experience. 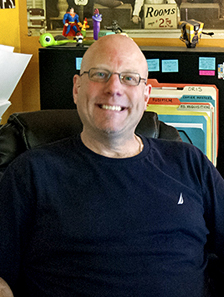 In 2002, he helped the company make the transition from the 'manual prepress method' to fully digital CTP ("Computer-to-plate") technology. He continues to keep us on the cutting-edge through continual equipment and software upgrades. Randall manages the entire electronic imposition, proofing and plating department singlehandedly, and his attention to detail has proven to be an invaluable asset. Randall and his wife live in Leicester and are parents to a quirky little jack russell terrier. He enjoys hiking, stunt-kite flying, and tinkering with his home-built pc.